Early 2016 is expected to be the time when the U.S. Fish and Wildlife Service once again proposes delisting the grizzly bear in the Greater Yellowstone ecosystem (GYE) in Wyoming, Idaho, and Montana. Back in 2007 the Yellowstone grizzly was actually delisted, but a federal district judge soon ended the delisting. The bears were put back on the threatened list in 2009. For at least a decade now the government has maintained that the grizzly bear population in the GYE is doing well and is probably growing, even though there is little specific agreement h0w many grizzlies there were at the time of the first listing (1975) or even now. Searching the literature I found a range of estimates for 1975 from 168 to 350 grizzlies. A fairly common view (since about 2003) is that the grizzly bear population is roughly stable at about 750 bears. This estimate does go up and down slightly from year to year. There will be one or two years of seeming population growth and one or two stable or falling years, but the number averages around 750. Mortality varies considerably by year. In 2009, 31 dead grizzly bears were recorded. 2010 saw 50 grizzlies determined dead. 2011 had 44; 2012 a record 56; but then 2013 and 2014 were much improved with only 29 and 28 mortalities. However, now at the end of 2015, just as the federal government is about to announce a new delisting for Yellowstone grizzlies, a record 59 dead bears have been tallied for the year. This record number of 59 will grow larger still. In every year additional, dead bears from the previous year are discovered. So in 2016 more dead bears will be added to the 2015 total of 59. The mortality details from 2009 on are easy to find on-line. Noticeable details are that hunting and conflicts with livestock are the two largest mortality categories, but every year there are also dead bears from unknown human causes. This category has grown in the last two years with nineteen grizzly deaths currently under investigation. There were ten in 2014, the previous high. The “under investigation” category usually means an illegal kill not otherwise reported. In a recent article, long-time grizzly bear conservationist Louisa Willcox expresses fear that much of this sudden increase is poaching related to elk hunting. Yellowstone area grizzlies today occupy considerably more territory than 40 years ago. These big bears are now common on the north end of the Wind River mountains, for example. They fully occupy the Gros Ventre Range. They have expanded from the north end of the Tetons to occupy most of the Teton Range and all of the valley portion of Grand Teton National Park. Grizzlies are often found on the plains and foothills north and east of the Absaroka and Beartooth Range in Montana and Wyoming. They have moved west, crossing the Madison Valley into the Gravelly and even the Snowcrest Range of SW Montana. More and more are found south of the Snake River in the Wyoming Range and SW of Jackson in the Snake River Range. There has been grizzly occupation all the way across Island Park in Eastern Idaho and also into the Caribou Range of Eastern Idaho. The federal government, and especially the state governments, strongly imply that the Greater Yellowstone is bursting at the seams with a surfeit of bears. They point to the bears in places they had not been seen for fifty, or even a hundred years, but this is no longer news. Bears have been living in these “new” parts of the GYE for at least a decade now. The GYE area that the delisting will probably protect for the grizzlies is called the “Primary Conservation Area” (PCA). This includes Yellowstone Park ‘s 2.2-million acres, plus 3.7 million more surrounding the Park. The primary conservation area includes pretty much the same territory that grizzlies lived in during the 1980s. It falls far short of the currently occupied grizzly territory. The map below shows the huge difference between the occupied areas of the 1970s, 80s, 90s, and in 2012. Is this expansion due to an ever growing bear population, or is it due to a thinning density due to lack of lack of food in the historically core grizzly bear area? Greater Yellowstone grizzly distribution by decade. Map by Yellowstone Park. Scientists just can’t agree how many grizzlies there are and if there is a population trend. If the population is about stable, how resilient is the stability in face of human or environmental pressure? Most of the trouble is that bear census in the GYE has always been done indirectly. Originally, there was no alternative to indirect measurement. For some time, however, DNA from the fur of individual bears has provided a more direct kind of measurement. Use of backcountry “stations” to snag fur samples off passing bears has proven very effective. This method was used some time ago to make a population count of the larger Northern Continental Divide ecosystem (NCDE) grizzly population of Montana’s Glacier National Park, Bob Marshall, Great Bear, Scapegoat and Mission Mountains wilderness areas (plus adjacent public and private lands). As a result the grizzly population figure for the NCDE is not much contested. When bear managers say the current NCDE population is 960 grizzlies, most people agree that is pretty close to the real number. Were this so in the Greater Yellowstone! Yellowstone badly needs a bear fur snaring study to determine the real number of bears. Yes, official estimates have been around 750 bears since about 2003, but the margin of error is said to be about 75 bears either way. Furthermore, the entire enterprise might be biased high or low. The government likes to say it is biased “low” — a minimum population. The states have reportedly said they are willing to maintain a population of at least 600 grizzlies in the GYE, about hundred bears less than the current estimated population, but what if the number they start out with is actually less than 600 (even as they might suppose it is 700 or more)? The number of about 1000 bears is often thrown around. If the population is a thousand in the GYE, a multitude of management errors might find the population still over 600. If it is 750, or well under 700 at the end of this deathly year, then delisting may soon drive the bear back to 1970s level, especially with the likely opening of a hunting season when the states take over. A big question is whether there will be a hunt in the primary conservation area? Daryl L. Hunter just wrote an article on the possible hunt and the inclusion of the PCA. 12 Responses to Record number of dead grizzlies in Greater Yellowstone! Not a big deal? I’m sure these deaths were a “big deal” to the bears that lost their lives due to “conflicts with hunters and livestock.” Chris Servheen, who wants Grizzlies delisted (which will result in Grizzly trophy hunts) is an utter disgrace. Recently I drove over Union Pass. The 15000 cattle in the Union Pass area have to be a daunting obstacle for bears passing thru into and from the Wind River Mtns. Wish the cattle grazing in that area were cut back, or halted. Wolves also migrate thru that area. Wonder how many bears are removed due to cattle predation. Wolves for that matter as well. 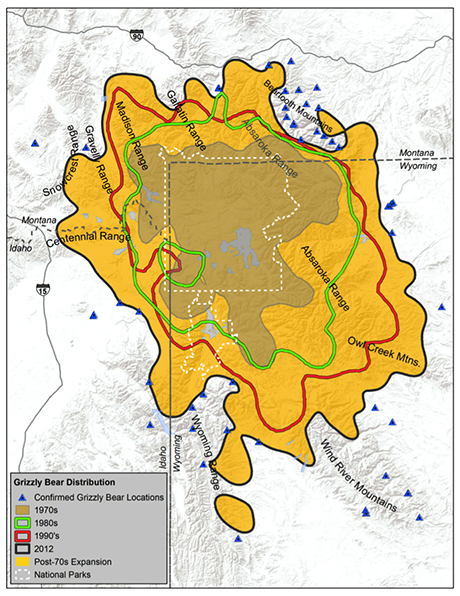 The Upper Green River area, including Union Pass, is a “black hole” for grizzlies. The Western Watersheds Project has made reducing or removing these public land cattle a priority. I think they are they only conservation organization working on that goal. Thank you Ralph. I did come across this: Cattle inventory (as of Jan 1, 2015): 89.8 million. Would like there to be a few more areas in the lower US where at least a few meager number of predators (grizzlies/wolves/etc) can live unhindered. I would like to see any write up or summary about the justifications and obstacles for removing or reducing (or mitigating) the effects of cattle/sheep in the Union Pass area. If you have a link or contact, very much appreciate it. say what you might about NGOs and the salaries or gripes that I hear played out here so often but HSUS gets it right so much of the time. This is a succinct rationale for why delisting Grizzlies is just wrong. Pacelle’s blog hits the nail on the head when he complains that the trophy hunting and livestock industries are treating the issue as though delisting was a done deal. The western states dividing up licenses to hunt bears. Pacelle makes the sad comparison to wolves. Boy would I like to see an amendment to the ESA prohibiting trophy hunting of predators that have been listed as threatened or endangered. I can’t help thinking sorry almost for the twisted mind that gets excited over killing large mammals or any species for that matter, for sport, bracing rights or to hang a head on the wall. They do get it right, and they are one of the organizations that get things done too. Griz delisting updates. I’m glad Yellowstone is voicing concerns! How? I can’t imagine someone driving this carelessly.